Microadventures Before and After Retirement - Can I Retire Yet? Travel, adventure, seeing and being in new places, is the spice of life for many of us. But there is never enough time. In the working years we mostly have to make do with a few weeks of vacation annually. By the time family obligations and house chores are done, there can be precious little time left for exploring the world each year. Even in retirement, to-do lists and routine activities can make it hard to get away for longer trips. The solution? Small adventures, near home, that embody the same excitement as larger undertakings. Despite a few grand adventures — including climbing El Capitan and traveling by truck across Africa — the vast majority of my own adventures over the years have been modest enterprises. Even in retirement, I take a half-dozen overnight or 3-day trips for every month-long road trip I embark upon. “Microadventures” is the title of a unique and beguiling book by adventurer Alastair Humphreys. The fascinating thing about Humphreys is that, though he is a professional explorer, he’d be the first to tell you that he’s not the strongest or fastest or most accomplished walker, cyclist, or climber of the lot. But he may just be the most creative. Humphreys is a master at concocting short, usually 1-2 day, adventures not far from home. And his book is filled with fascinating stories and beautiful photography from his escapades. Though some of his projects could be a bit rugged for the average retiree (getting wet, eating out of cans, sleeping under the stars, are common themes), I think his mindset is perfect for us. Because it’s the ability to devise fun projects of exploration, customized to our own interests and limits, that keeps life before and after retirement interesting…. In this post I’ll recount some of my own microadventures, in addition to Humphreys’, and provide tools and inspiration for designing your own. Mixed in will be photos from some of my recent adventures just this summer…. Having an “adventure” usually means trying something new, getting out of your comfort zone, pushing your limits. It means choosing a goal where the outcome isn’t entirely certain. It’s not necessarily about crossing oceans, navigating deserts, or summiting high peaks. Though it could be. For some, adventure might be taking the bus across town to a new museum. The point is to tailor an experience to your own strengths, skills, and passions — and to push yourself a little bit. Almost all adventures, micro or otherwise, involve some travel to a different location. Any change of scenery almost immediately refreshes and challenges us. Exploring new places is exciting and stimulating. Dealing with differences forces us to adapt and learn new things. But this doesn’t necessarily mean jetting off to Bali. Are there unexplored neighborhoods, parks, or attractions near your home? Some of my best microadventures have been no more than an hour away. Traveling for an adventure implies some means of transportation. Americans are accustomed to moving about in our plush personal vehicles. But some of the best adventures happen when we leave those mobile living rooms behind, or supplement them with other modes of transportation. Mix it up! I’ve had many great one and two-day outings that combined hiking and/or biking with public transportation — trains, buses, and boats. The essence of many microadventures is spending the night in a new place, perhaps someplace a little less comfortable than your own bedroom. Humpreys turns this into an art form, spending many nights in sleeping bag and bivouac sack in fields on the outskirts of cities in his native British Isles. To be honest, I’ve done little of that style of microadventure, and none of it in recent years. The geography and laws here in the U.S. make “stealth” camping less appealing, though it is still feasible and legal to camp spontaneously in most of our National Forests. That said, I am a fan of lightweight car camping. My trusty Subaru Forester is prepacked with essential camping gear and set up for comfortable sleeping — diagonally in back with the seat down. That saves me setting up a tent on short trips. I’ve been known to leave town late in the afternoon, cook a satisfying dinner over a campfire, stay up late watching the stars, sleep in the car, and be back in town by mid-morning the next day. This makes for a great adventure, with minimal impact on my other obligations! The simplest of all microadventures is to step out the door of your home and go somewhere you can easily reach by foot, bike, or public transportation, returning home the same way. Humphreys loves to hike and camp from home. He relates with relish the joy of sleeping on a hilltop overlooking a nearby village. This might not be practical for urban dwellers in the U.S., unless you’re near a National Forest or Park. But how about walking or biking to a new trail, campground, or bed & breakfast on the outskirts of your town? One of my most memorable adventures was an all-day bike ride. 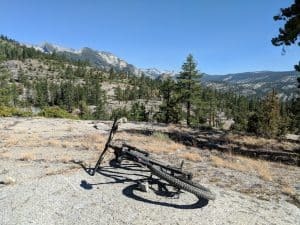 I got dropped off at our local ski area in the morning and rode my mountain bike down miles of rocky, forested trail alongside a mountain stream. I then pushed over a steep ridge, reconnected with the paved road, and cycled back to our front door, just in time for dinner. The next step up in microadventuring fun is to mix in several modes of transportation. This leverages the distance you can travel, and gives you many more options. Humphreys loves to take advantage of his country’s extensive train system to ride out to a rural location, and hike or bike from there. 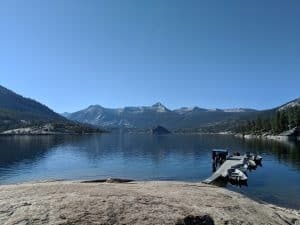 Just a month ago on our California trip, we headed out one day from remote Mono Hot Springs, driving rutted single lane road to a small outpost on Florence Lake. From there we caught a small ferry across the lake and then hiked in five miles to Muir Trail Ranch deep in the heart of the Sierra. We returned the same way in the evening, ferrying across the lake before sunset. It was an exciting and spectacular day in the mountains, and on the water. I love to combine biking and hiking for interesting adventures that maximize both modes of travel. Sometimes I’ll bike from home to a trailhead, lock the bike and take a hike. Sometimes I’ll get dropped off somewhere with my bike, do a hike, then ride home. One of my favorite tricks involves auto, bike, and foot travel: I’ll drive to a high point and lock my bike there. Then I’ll drive back to a connecting trailhead and park the car. I’ll then hike up to the high point, unlock my bike, and ride it back to the car. This is a great formula for a long hill climb that you’d rather hike. Do the uphill on foot, and coast back on your bike! As the national parks have introduced public shuttles on regular schedules to combat congestion, they’ve also made it easier to craft interesting microadventures that involve hiking or biking across wild terrain connected by shuttle stops. Acadia National Park and Devils Postpile National Monument are two places I’ve done this in person. You can even find ways to mix up the transportation for routine chores around town. Last winter I had to pick up our small RV after maintenance in the neighboring city. I got up early and caught the train down, strapping my bike into the luggage compartment with the other commuters. At the train stop in the big city, I hopped on my bike and rode ten miles to the RV dealer. There I paid for the service, strapped my bike on back of our rig, and drove it all back home! Car camping is one of the easiest adventures. All you need is a free evening and a nearby campground. Most people can throw together enough equipment and expertise to make it through a night in the woods with their vehicle nearby. The point isn’t to be perfectly comfortable, it’s to have an adventure! Humphreys savors cooking dinner over a fire with friends. I can vouch there is no evening that isn’t made better by a crackling campfire. And car camping is the perfect opportunity to build one. There are several parks and campgrounds less than an hour from our home where I’ve camped for a night on short notice. I like to go mid-week and off season when there is always space. I’ll check my camping gear in the car mid-afternoon, hit the grocery store, drive and set up camp in the woods or desert, build a fire for warmth or cooking, then stay up late watching the embers and the stars. Once when I didn’t have time to camp, I just went for a sunset hike and cooked a picnic dinner, then drove home after dark. Car camping also makes for a great microadventure in the context of longer trips. Last spring, at the start of a four-day trip to conduct some business in a nearby town, I car camped for a night at spectacular Great Sand Dunes National Park. I arrived late afternoon, set up camp, went for a hike until sunset, cooked dinner, slept in the car, and left early the next morning. Keeping a minimal set of camping gear in my car semi-permanently makes preparing for such trips much easier. I just add food and clothing, and I’m ready to go! Though backpacking won’t be for everyone in their later years, I’ve found it’s the ideal activity to challenge myself in the outdoors. Backpacking still demands self-sufficiency, route-finding, and problem-solving, but is more appealing now than the strenuous rock climbing adventures of my earlier years. I hiked long sections of the Appalachian Trail in high school and college and still dream of doing a long “through hike” on one of the major trails. But, for reasons of health and logistics, that just hasn’t happened yet, and may never. Meanwhile, my standard backpacking itinerary has been the two-night trip. That’s long enough to get the authentic experience of vagabonding outdoors, without the planning and commitment required of a long trek. To keep it interesting and avoid backtracking, I’ll do a loop or lollipop or shuttle a point-to-point hike if possible. I’ve done a dozen or more such trips in recent years in New Mexico, Colorado, and California. While they haven’t set any records for endurance, each has been memorable in its own way. 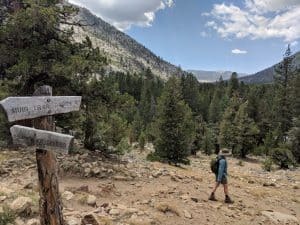 Even short, one-night backpacks have their merits: This June I arrived at Great Basin National Park late one afternoon after driving all day, and found that the car campgrounds were full. Bummer. The mountains were calling and I wanted to stay and explore this stunningly beautiful and relatively unknown park. Checking with the rangers I learned that, though the campgrounds were full, there were relatively few restrictions on backpacking: I only needed to hike in off the road a ways. So I grabbed my backpack out of the car with just the essentials for one night. It was only an hour or two to sunset when I hit the trail. After a couple of miles, I found a beautiful campsite near an alpine lake and spent a memorable night out, spotting Cygnus and the Northern Cross in the ink-black sky for the first time in years. The next morning I hiked past another alpine lake, toured a rare grove of ancient Bristlecone pines, and was back at the car and on my way for the next leg of my trip by 10 am. And don’t think that backpacking can only be done in remote, wild places. Humphreys hiked the beltway around his city for several days, in winter! If roughing it or being outdoors is not your thing, or not your main thing, consider a short road trip built around a theme. Humphreys suggests recreating a historical journey. A couple of years ago I did a several-day road trip through extreme southern Arizona, tracing the path of the Apache Wars. I visited Chiricahua National Monument and the site of Geronimo’s surrender, among other memorable spots. The Apache theme made the trip more meaningful and memorable to me, especially having just read several books on the subject. Also that year I did a two-day drive through the mountains of western North Carolina visiting many of my favorite hiking, biking, and climbing spots from the past, with a special focus on the numerous waterfalls in the area. It was a poignant adventure down memory lane, lasting barely 36 hours. Spending the night in an old-school but beautifully-maintained motel in Cashiers, NC made it all the more memorable. Humphreys also likes traveling from a high point to the sea or vice-versa. In many coastal cities it’s easy enough to do that in a single day. When I’m new to an area I love to the go to the highest point and scout out the terrain. Why not connect those expansive views with one of the spots you can see down below — a beach, a park, an attraction — to create the perfect microadventure! Though I didn’t have a word for it at the time, the “microadventure” concept evolved naturally for me out of my working years. There were long stretches, especially in the final years of my career, when the job was just a job and I looked elsewhere for passion. Finding time to travel was essential to keeping my sanity on the long trek to financial independence. In the years leading up to my retirement, I had negotiated a generous vacation package. But, usually, instead of taking those weeks all at once, I parceled out my time off into 3-day weekends. One summer I was able to take Fridays off straight through from Memorial Day to Labor Day. Those small blocks of free time were my salvation, allowing me to get away for a long day of hiking or biking, or a night of camping, while still spending time with family, taking care of house projects, and developing the personal interests that eventually turned into this blog. Microadventures, whatever form they take in your life, can be essential to preserving your mental health while still working. They provide a taste of freedom and let you try new activities and push your comfort zone while still meeting family obligations and holding onto the security of a career. Once in retirement, microadventures are every bit as fun and rewarding as before. I love that I can unplug from my routine life for a day or two whenever I want now to enjoy a night out somewhere new under the stars, getting a fresh perspective on the big questions in life. So next weekend — or maybe even on a weekday — throw some gear in your car, or pack a bag and buy a train ticket, or hop on your bike — and give it a try! Awesome post Darrow! I do some of the same “multi-mode’ stuff, and I throw a standup paddleboard in for good measure. I can actually put a bike on my inflatable SUP, go down a river, and then the inflatable SUP packs small enough to carry on the bike so I can ride back to the car. I’d like to get a Alpacka packraft but they’re darn pricey. And I have a Subaru Outback but I’m 6’4”, so sleeping in it is pretty tough, even diagonally. I generally just bring an ultralight tent or a bivy and set it up instead as it’s more comfortable. Thanks AF, that’s a great idea combining a standup paddleboard with a bike. Enjoy your adventures! Reminds me of a saying by one of my son’s Band Directors – “The quality of the experience is not proportional to the distance traveled.” Don’t get me wrong. I have had wonderful experiences far from home that brought us to adventures and cultures that could not be found close to home. However, there has also been some duds. It is the adventure, not the time spent in a car, plane or bus. Great article. Thanks for the reminder of the joys of the small things and simple things in life. And as an NC native now living in TX, I too try to never miss a return to the Appalachians when possible. We love the idea of a microadventures. We’re in the same bucket in our working years and can’t always get away far long stretches at a time. To save money, we’ll go to our local city or state park to enjoy the day. When we’re hiking, many times all of our hikes we might only consider if it has a beautiful waterfall that we can relax at towards the end. Themes sounds like a fun idea. I can only imagine hiking around our city pretending like it’s the end of the world. Haha! Great post, Darrow – you’ve been missed! My husband and I are about to embark on a several-year semi-retirement before full retirement, and have been talking about similar small adventures from our home base in Colorado as a great way to take advantage of having more free time. Sending this post to him now! Good grief! There’s a name for what we’ve been doing. We bought a new to us 17 ft travel trailer – our motel room on wheels. It’s as close to roughing it as we care to go:) and small enough to go almost anywhere. We’ve been trying to schedule a 2 or 3 day trip each month – mostly 2 to 3 hours from home. We too opted for our little motel room on wheels after a lifetime of camping from cars, motorcycles, etc. Indeed we started before they were called Micro Adventures! Just a long weekend and a few bucks in the pocket. Sleeping bags, single burner stove, and sometimes even a tent or snooze in the car. Dang Darrow this article hit the spot. Thank you for reminding us that adventure can be close or far. Can not wait to retire to be able to travel and adventure out during the week and shoulder season so less crowds and cheaper prices. Seeing new things and new experiences. Darrow, as always a great article. My take is that most people rather watch an adventure, rather than take an adventure – sad. We have a rare adventure in common: travelling by truck through Africa. 43 years later, that adventure still lingers, as do other rockclimbing and backpacking adventures. Always enjoyed your ability to take boring and confusing financial issues and present them in a clear, interesting and concise way – a rare talent. Thanks for sharing them with us. Welcome back, Darrow! I wholeheartedly believe that “microadventures” are a salve for the soul. Too many of us look forward to the next big vacation or the next stage of our lives when, in fact, it’s our day to day activities that form the fabric of our lives and offer the most opportunities to enjoy rich, fulfilling adventures – big and small – at every stage. While our microadventures of choice often involve a lakefront campsite and our travel trailer, my husband and I find discovering a new bike trail, walking through a local park to check on the hawks or even taking bagels and coffee down to the river to watch the boat traffic are small excursions that bring pleasure to our days and live large in our memories. By the way, a month or so ago I added “Can I Retire Yet” to my newly formed blog roll. At the time, I had let Chris know, but I wanted to take this opportunity to thank you, personally, for all of the excellent information you’ve provided over the past couple of years as I was transitioning from full time employment to retirement. I couldn’t begin to tell you just how much some of your posts helped by providing food for thought or a jumping off point for additional research on my part. So thank you – for all you’ve done and for all you and Chris continue to do for your readers! 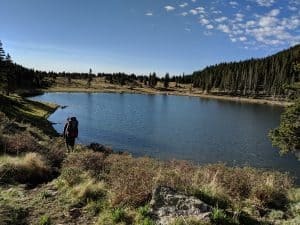 Great article – It’s been too long since i’ve done any real hiking or canoeing and this article reminded me to get out there before the summers over! As a financial advisor and wilderness guide, I’m completely onboard with your post! Camping is the ultimate travel hack, allowing for great freedom and flexibility, and the chance to live in different places for peanuts. Starting with quality backpacking gear, as opposed to bulkier, low-grade car camping gear will let you live comfortably out of a modest sized pack, nearly anywhere. On the mixed transportation theme, many times I’ve added on wilderness visits when traveling for work. It’s easy, even on a plane, when everything you need fits neatly in one pack that’s comfortable to carry for miles. 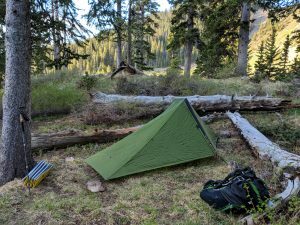 A thought, I love backpacking, but, once you learn the basics, it’s a relatively low-skill endeavor, compared to some other wilderness activities. 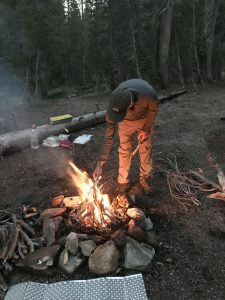 I’ve found that digging into primitive skills, bushcraft, wild edibles, paddling skills, and the like, lets me go deeper into the “micro adventure” experience without necessarily having to go further. The focus, practice, and learning, required for these types of high-skill, retro-tech (and very low cost!) outdoor adventures really creates a rewarding an immersive experience! I sometimes even go mini-microadventuring…I live in great big NYC, and I’ve lived my whole life here. But I traveled to other cities for my job and would always find time to walk around to see neighborhoods and a museum or two. But now in retirement, there are plenty of places right here I’ve never seen…Riverside and Morningside parks, the uber-quiet Tottenville area of my home borough of Staten Island, the north end of Central Park, all the streets of SoHo, etc. So I take a half day to create my own walking tour, sometimes packing a lunch or finding a nearby lunch joint, and check off that day’s trek of places desired to see, never visited, but now traversed. In such a big city as this, it’s wonderfully satisfying to get to know even more of my city! Coming from NYC, which is so fast and so urban, just getting to a slower area surrounded by nature is a micro-adventure. My husband and I have been hitting the Old Croton Aqueduct trail which spans Bronx and Westchester counties, over 22 miles. We pick a different starting point each time, and it enables us to 1) get out of the city; 2) explore a different part of the city; and 3) get some steps in. These adventures help you recharge, commune with nature, and get back to the basics of what you enjoy in life. I’m happy to hear from Darrow, who I’ve missed. When taking a mini break I always sleep well and wake refreshed and raring to go. Coral Pink Sand Dunes State Park, near Kanab, Utah, and George Washington and Monongahela National Forests in VA and WV are personal favorites. Go forth and enjoy!